Soaring live orchestral music, opera singers, an imposing new show venue complete with classical sculptures: Burberry’s latest display is a very grand affair indeed. So it comes as no surprise that the clothes on show are just as opulent. Minimalism had no place here: The luxury British brand’s new collection featured flamboyant military coats, frilly high collars reminiscent of portraits of Queen Elizabeth I, rich velvet and brocade, and silky pajamas layered under floral jackets -- designs intended for both genders. For the first time, the target audience is not just female fashion fans. Monday’s show marked a move by Burberry to merge its traditionally separate women’s and menswear shows. Fittingly, creative director Christopher Bailey said he was inspired by Virginia Woolf’s novel “Orlando,” whose hero is a poet who changes gender from man to woman. “I was looking for this idea of fluidity of gender, fluidity of travel, and I love the poetry in ‘Orlando,’” Bailey told The Associated Press backstage. The heritage brand also introduced another first: Fans can “shop the show” straightaway, both online and in-store. The move, also introduced by several other brands this season, is seen as an industry game changer. Traditionally, fashion shows are exclusive previews intended only for industry insiders, and ordinary consumers have to wait months before the new styles are released. Not anymore. An elaborate python and ostrich leather handbag shown Monday went on sale immediately -- at a formidable $2,660 each. The new strategy may stoke more buying interest from fashionistas, but whether it brings in more profit is something that remains to be seen. A shipwreck has never looked so elegant or darkly romantic. 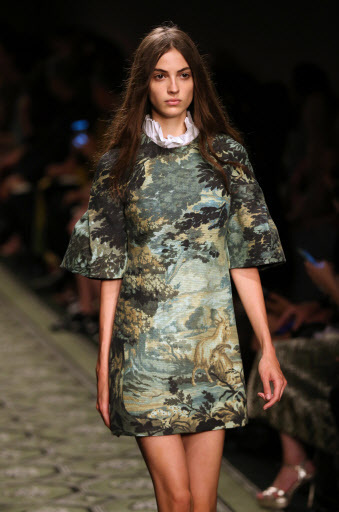 Canada-born designer Erdem Moralioglu always infuses his shows with a sense of drama and haunting beauty, and this time is no different. Models wore large floppy black hats that obscured their faces, gliding on a weathered boardwalk that appeared to weave in and out of water. 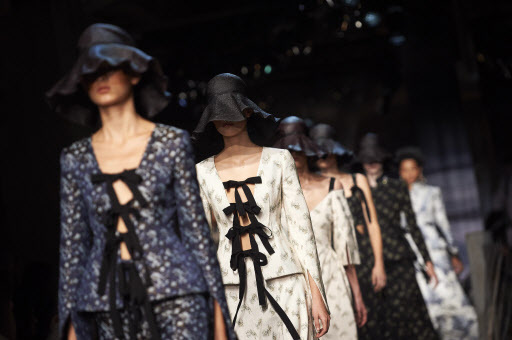 The dreamy clothes reflected the brooding nautical theme, crafted in washed-out shades of blue and silvery grey, and all the frocks seemed to be covered in miles of rolling ruffles, lace, frills and velvet ribbons. As always with Erdem, the devil is in the couture-like level of detail. Little gemstones twinkle on brocade gowns, and some of the embroidery is stunning in its intricacy, especially the rich Oriental-style florals overlaid on sheer delicate fabrics. For many, Erdem’s creations may be too much like costumes for a period drama. But at a time when much of fashion is so disposable, it’s pleasing to see a designer insist on making every piece a work of art. Museum-goers could be forgiven for wondering where all the odd, funny shoes came from as the fashion crowd descended like a cloud of overdressed locusts at the usually staid Tate Britain on the banks of the River Thames. With American Vogue editor Anna Wintour presiding in the front row at the Christopher Kane show, guests arrived with an emphasis on sparkly boots and heels, with green and silver sequins predominating. There were mustard thigh-high boots, silver patent leather shoes with tassels, and pointy black-and-red suede ankle boots with heels shaped like a sailboat’s winged keels. Once the show began, the shoes were quickly overshadowed by Kane’s eclectic creations. Known for his edgy designs and his references to modern art, some of the dresses took a Jackson Pollack approach to color and relied on wildly clashing patterns to carry the look. Despite the museum setting, there is nothing safe or conventional about Kane’s approach. Some of the three-quarter-length coats were ripped for impact’s sake, and some of the elegant dresses had cutaways and high-tech mesh panels. Long black gloves were meant to be iconoclastic -- not a nod to ballet days -- and were decorated with colors and cutouts. The former wunderkind’s own label is now 10 years old, but he is not repeating himself. Some of the multicolored coat designs had a fresh, fevered look, covering dresses that evoked a similar mood if not similar colors or patterns. Some of the dresses sported dozens of metallic hooks, some closed to keep the ensembles together, others serving no apparent structural purpose. Many were set off by Stephen Jones’ distinctive hats, often in solid colors to offset the controlled chaos of the ensembles.